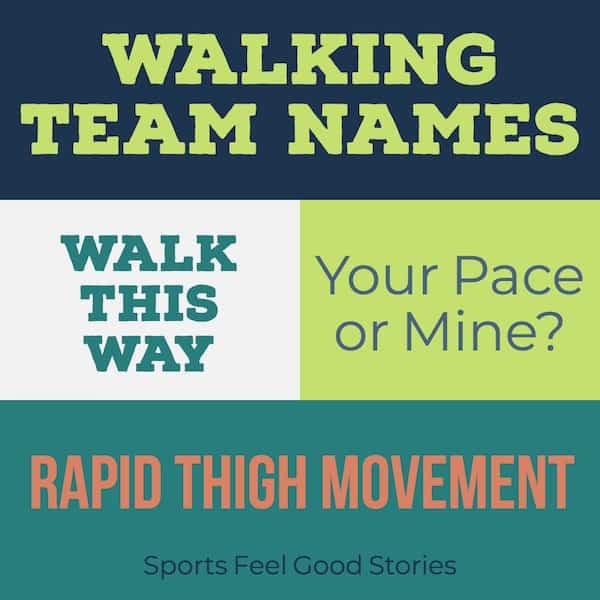 Walking team names serve as a flag that a group of walkers can rally around. For this reason, it’s important to select the right name for your group. We can help. Check out our collection and see if one of the options connects with you and your group. 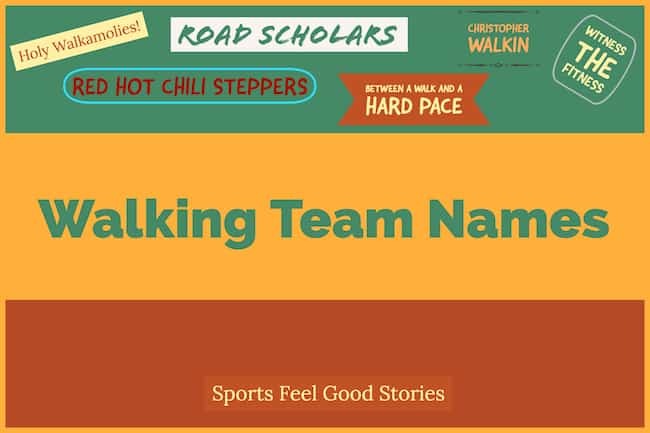 We walked far and wide to assemble this fun collection of name ideas for your walking team. Enjoy! Red Hot Chili Steppers. The Red Hot Chili Peppers is a Los Angeles band that was formed in 1983. With many well-known songs including “Under the Bridge” and “By the Way,” the band has developed a loyal following. If you choose this name, your team’s fight song should come from this band. Legs Miserable. Les Miz took Broadway by storm, and now with this clever pun, you can shock the walking world. Maybe shock is an overstatement? 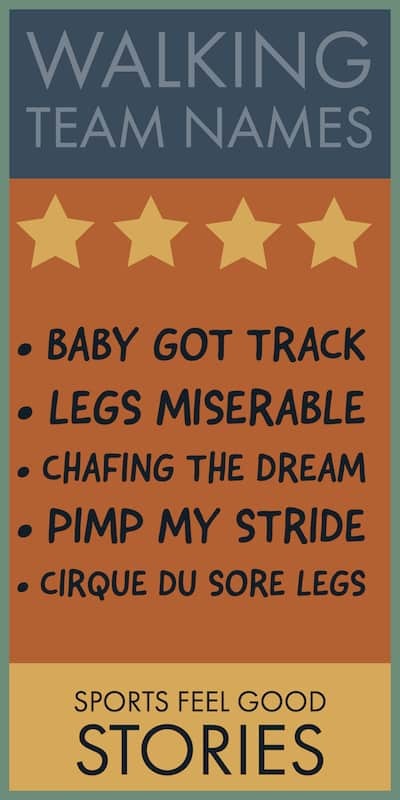 Cirque du Sore Legs. With perennial Las Vegas shows and traveling extravaganza, the folks at Cirque Du Soleil have carved out a name for themselves in the entertainment world. The sore legs pun is a fun one. Christopher Walkin. From Deer Hunter to Dead Zone, this actor is well known and folks recognize the name. His “more cowbell” skit on Saturday Night Live stole the show. This name might steal the show for your team. The Young and the Breathless. Okay, soap operas are not necessarily a growing business, but The Young and The Restless has been the number one daytime drama for some 28 years! The small tweak to “breathless” is perfect for the aerobic sport of walking long distances. Witness the Fitness. When LeBron James’ “We Are All Witnesses” hit the media, everyone took note. Folks will take note of this team names as well. The fact that “witness” rhymes with “fitness” is a great bonus. Chafing the Dream. It’s not “chasing the dream,” but it’s close. And, it works. Road Scholars. Short and sweet, this one is sure to be a favorite with some groups. My Sole Called Life. A play on words off of My So Called Life, the TV show that starred Claire Danes before she was under-medicating on Homeland. Pimp My Stride. Inspired by “Pimp My Ride,” this is a fun option for the right team. Between a Walk and a Hard Pace. The idiom “Between a rock and a hard place” refers to those difficult times when you have two options – and neither is very pleasant. This one is pretty clever. Honey I Shrunk the Gut. Too Inspired to be Tired. Slow Motion to the Ocean. Worst Game of Tag Ever. Four Score and Seven Blisters Ago. Moon over my My Hammies. Don’t Stop Until You Step Enough. I ran from the Law but the Law Won. Started Slow and Getting Slower. Chasing the Ice Cream Truck. Six Cheeks to the Wind. The Young and the Breathless. Bringin’ up the rear with no fear. Liar Liar Legs on Fire. Flip Flops in Porta Potties and Other Bad Decisions. The Fats and the Furious. You’re on Walking Team Names.